On 29th November 2017, Prof Nick Gill was invited to give a talk at the The City Law School Department Seminar at City University London. 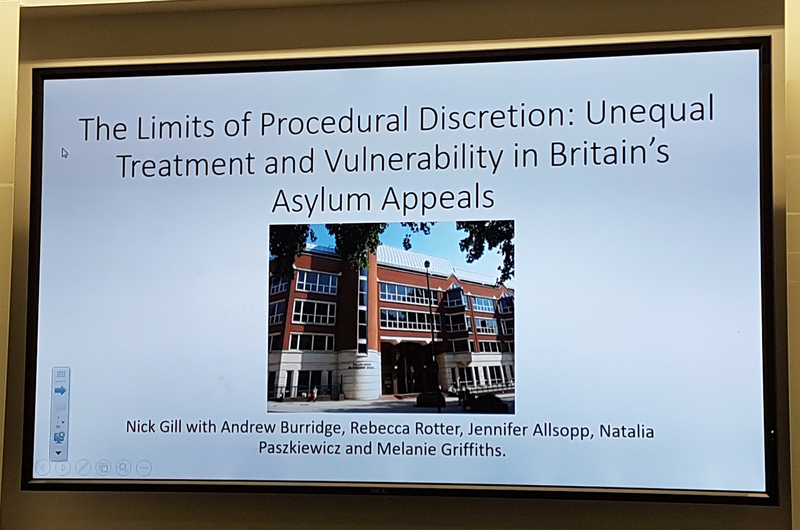 Titled “The Limits of Procedural Discretion: Unequal Treatment and Vulnerability in Britain’s Asylum Appeals“, the talk drew on Prof. Gill’s previous work on asylum tribunals in the UK – the foundation of the ASYFAIR research project. We thank Dr. Nora Honkala at City University London for inviting Prof. Gill, offering him the opportunity to speak about the project and its findings. Studies of procedural in-court judicial discretion have highlighted a dilemma between the imperative to reduce it owing to its potential misuse and preserve it owing to its importance in protecting vulnerable groups. This talk offers a new framework with which to enter this debate and new quantitative empirical evidence that favours the former position over the latter. Drawing upon 240 in-person observations of Britain’s First Tier Tribunal (Immigration and Asylum Chamber), the talk demonstrates that judicial discretionary behaviour that is either vulnerability-neutral, vulnerability-amplifying or correlated with extraneous factors outweighs vulnerability-redressing behaviour, despite the sensitivity of this particular jurisdiction and the guidelines that consequently exist for judges. These findings lend support to calls to limit judicial procedural discretion. The talk concludes by offering some cost-effective suggestions about how to do so.